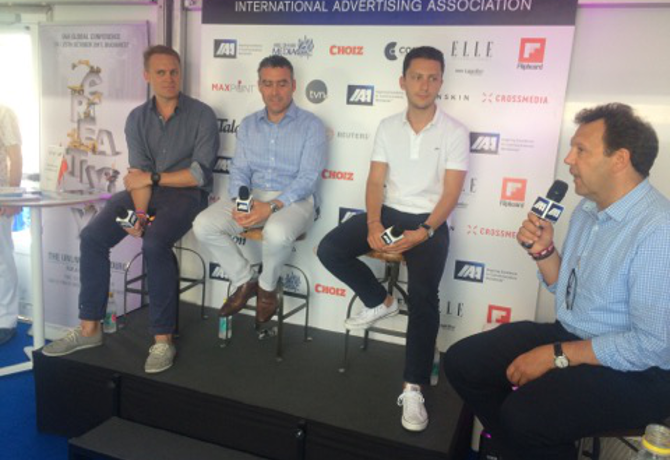 Inskin chief executive officer Hugo Drayton chaired a lively discussion on the monetisation options available to three very different publishers with diverse perspectives at the IAA cabana at Cannes Lions. FT global trading director Danny Aldred takes a yield as opposed to a scale approach to programmatic, focussing on understanding where it fits in to the marketing funnel to pull in subscribers, while Lagardere Global vice president international advertising Julian Daniel said that “programmatic isn’t really affecting” his business, as the majority of revenue comes from direct deals, with programmatic still a fairly new concept in the fashion industry. Discussing the fear of over reliance on data, Bridge said the bigger worry was a loss of context, with people buying just on behaviour, while Aldred commented that he believes the industry is becoming reengaged with audience and context. On the subject of the Facebook Google duopoly, Daniel feels that it’s a tricky relationship as it is necessary to work with them, despite them acting as competitors. Having used a subscription approach since 2006, Aldred discussed the importance of working with social media that allows you to monetise content in the way you want. According to Bridge, branded content has a place when “bullishly” well labelled; while Aldred described the FT as “late to the branded content party” due to its operational structure, he said that the trust of readers is of paramount importance so the publisher is constantly running research to monitor how open and receptive the audience are. He continued that sales teams’ skill sets need to change but the need for sales people won’t reduce, while Daniel commented that sales staff now need to be more digital and tech savvy to understand the importance of “programmatic to the funnel”. On the subject of pushing for more viewable ads, Bridge believes it makes complete sense and should have been done years ago with the industry innovating around new formats. Discussing the misalignment of metrics, Aldred talked about the importance of starting out with an approved set of KPIs “and not changing halfway through the campaign”, adding that if both the client and media agency is in the room together, the margin of error can be eradicated.